Seat bouncing is a good technique to use when your approach into a jump is short and you need more height and/or distance and/or don’t have enough time to stand up for the jump. Since you’re sitting on the seat your body weight is going to go straight into the bike and therefore compress the rear suspension more, causing it to rebound harder and give you more lift (airtime) out of the jump. If you were standing your legs could absorb some of the compression and rebound, keeping you lower. When seat bouncing, clutch and throttle control are very important and usually pulling back on the bars at the right time is also important for these two things are what control whether your front end is high or low. You see, you have to deliver the power to the rear wheel just right with the clutch and throttle as that rear wheel compresses into the jump and rebounds out of the jump. The timing with the clutch and throttle and jerking back on the bars is critical in order to keep the front end from dropping. This is an advanced technique and even then can only be used on short approaches where you’re accelerating all the way through the compression part of the jump. The jump face also has to be smooth with no kickers in it. Okay so that’s how your body movement controls the jump now let’s take a look at how the throttle controls the jump. 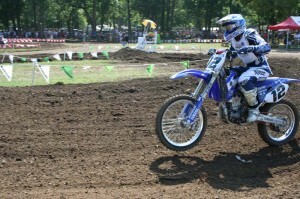 You see when you throttle off of a jump (accelerate off the jump) the throttle will also keep the front end up. 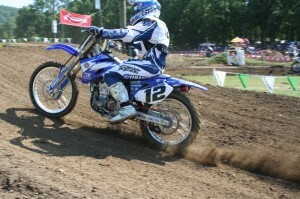 So the more you throttle off a jump the less you will have to nudge back with your body movements. And vice aversely when you chop the throttle off as you rebound from the jump the more you will have to rely on your body movements. You have to hold onto the grip and control the clutch independently. This is true for when you’re riding on the track as well, but for the start clutch control is even more important then when riding on the track. 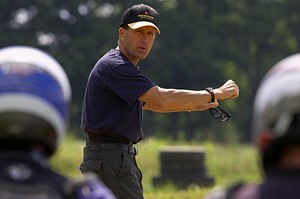 Therefore you should use your three outside fingers on the clutch while you hold onto the grip with your index finger. This way your three outside fingers will allow you to have good strong clutch control while your index finger can pull your body position forward as you shoot out of the gate. It’s also okay to use your two inside fingers on the clutch and of course your other two fingers to hold onto the grip. If you didn’t use any fingers on the grip you couldn’t pull and hold yourself forward. Or if you only used one finger on the clutch you wouldn’t have good strong clutch control for a perfect start. With your three outside fingers on the clutch pull the clutch in and select first or second gear. Then let the clutch out until it just starts to engage. Then pull it back in just the slightest bit under engagement. This is where you want to hold the clutch. This way it will begin to engage as soon as you start letting it out. With this clutch setting technique you will know that the bike is in gear and your clutch will be set and ready, not too far out and not too far in, but just right for the real thing hole shot. It’s very important to control the clutch all the way out. Don’t just start slipping it out then let it go. And don’t release the clutch in a jerky motion. When done correctly it’s just one controlled smooth release all the way out. You are pretty much holding the throttle in one position according to traction and feeding the power to the rear wheel with the clutch. You see, when you feed the power to the rear wheel with the clutch the response is instant. If you rely on the throttle the power has to go through the carburetor and the response at the rear wheel can be delayed and not as actuate, even after you are pretty far out of the gate, if the front wheel starts to raise slip the clutch a bit to bring it back down. Control the clutch all the way out at all times during the start. The rule of the track here is to leave the clutch out while braking so the engine helps slow you down and helps control the braking process. It’s kind of like anti lock brakes. The best stopping power is just before the rear wheel locks up and that’s just what leaving the clutch out will help you with. This is done when you’re still carrying some speed into the corner. If it’s a tight corner where you’re going to be slowing down to a slow speed in the middle of the corner and/or if you’re going to do a brake slide than you have to pull the clutch in so you don’t kill the engine. I’ve seen this technique of leaving the clutch out while braking misused and abused by a lot of beginner riders. Every time they apply the back brake they put the clutch in. They do this because they don’t have good braking control and by stabbing the rear brake on they would stall the engine. Sometimes making it stall even easier by being in too high of a gear. It’s really the same technique for 2 strokes and 4 strokes. It’s also the same when exiting a corner with 2 or 4 strokes. 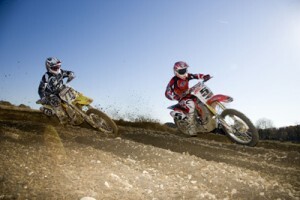 The 2 stroke does depend on the clutch more than the 4 stroke but if you’re pulling a high gear out of the corner even the torquey 4 strokes can use a little help from the clutch when exiting the corner. A good rider can make his bike drift slide into a corner real pretty like by leaving that low end lever out (the clutch). When a rider pulls the clutch in while braking at speed he’s taking a chance of locking up the rear wheel and sliding out too much, then his automatic reaction is to let up on the rear brake too. This causes the bike to straiten up and then he hits the rear brake again and so on and so on. This is especially the case on a high speed slippery approach to a corner. Learn to feather those controls or lock them up and every thing between. It takes a fine feel to go fast. Cornering is an art form. To get really good at it you have to have a lot of talent, know all the techniques inside and out and then practice it frequently in many ways over a long period of time. 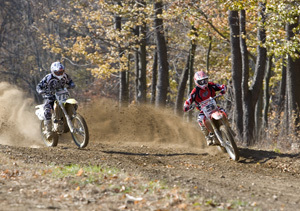 There’s much more to cornering than just leaning over and going through the turn. There are things like the angle of the corners, whether they’re banked or off-camber, sharp or sweeping, and the conditions of the track. Then there are the techniques of cornering between the rider and motorcycle. There are even techniques that affect the handling of the motorcycle in the corner. These techniques make the motorcycle either hold the track or brake loose and pivot, slide through the corner. In order to do a corner fast you need to carry as much speed as possible and as long as possible into the corner, slow yourself down just enough to still have control at the exit dex, (the exit dex is where you go from braking to accelerating) and then get on the gas as soon and as hard as possible. In order to carry a lot of speed into the corners, you need to have a fast and late approach dex (the approach dex is where you go from accelerating to braking). With this in mind, we can understand that a very important part of cornering is braking. To be good at cornering, you have to be good at braking. Of course, all through the corner, you have to maintain complete relaxed control. Tightness and mistakes will only make you tired and slow you down, if not make you crash. Remember, you can only try as hard, and go as fast, as you can do the basic techniques correctly and maintain relaxed control. So, if you’re tight or making mistakes, you will benefit by slowing down, which in turn will allow you to learn how to go faster. Straights are usually the easiest but because of the speed you can really crash hard. Of course most of it depends on the soil condition and the room you have for mistakes. If you’re speeding through the trees over rocks, tree roots, ruts and mud you better keep her under control the entire time. Another tricky straight away condition may be over big uneven bumps. Whatever the conditions are following are some key points. 1.) Scan the ground as you’re going along and see all the details. At the same time keep your focus out far enough ahead of you that you are ready for what’s coming up. This takes the kind of concentration to light a news paper with a magnifying glass in the sun. 2.) If it is at all rough you should be standing on the pegs in the central body position and make the bike go exactly where you want it to go. Squeeze the bike a little with your knees. This will make you more connected to the bike for better control. The thing that is most likely to through you off course is hitting something with your front wheel that you didn’t see. Going fast on the straights is kind of like jumping doubles. You don’t jump distances you don’t have control over and you shouldn’t do speeds over rough ground that you don’t have control over. If the fear is there it’s most likely there for a good reason. When you get enough seat time and confidence the control will be there and the fear will not. In the mean time you may consider paying attention to that fear, it’s a survival instinct. Gary Semics riding tip for February. I am really surprised how many people are interested about the technique of riding on the balls of the feet or riding on the arches. I’ll tell you right up front that being comfortable riding on the balls of the feet takes a lot of practice. But when a rider does become comfortable with this technique there are three benefits to it. # 1 you have more body travel, #2 you won’t hit the shifter or rear brake by accident and #3 you won’t get your feet ripped off the foot pegs from your toe hitting the dirt. As I said, for this technique to become natural its takes a lot of the correct type of practice. So don’t throw it out the window if it feels awkward at first. It’s kind of like down hill skiing. It’s easier to keep your feet farther apart when you are a beginner but the pros keep their skis closer together. 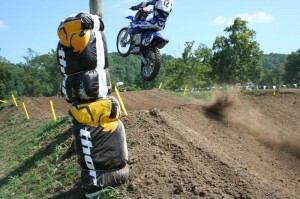 One place motocross pros are always on the balls of their feet is through the whoops. 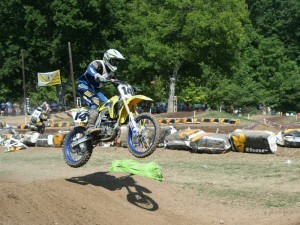 If it can be done through the whoops it can be done anywhere on the track. The only acceptation is if you’re going to land hard from a jump or even case a jump. In this case you would want to be on the arches of your feet so you don’t sprain your ankles. Just make sure you have your toes pointed out a little so you don’t hit the shifter or rear brake by accident. It all comes with knowing the correct techniques and a lot of quality practice time. 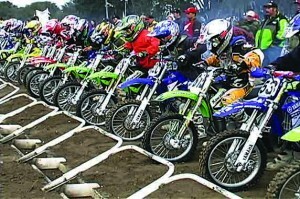 For all the correct techniques in an affordable easy to understand format check out my Motocross Practice Manual on the DVD ordering page of my website.